Fleet managers – including IT professionals, safety directors and operations managers – all can put pencil to paper and contribute to lowering fuel consumption by employing any number of strategies and technologies. See which items in this pdf white paper you can utilize to keep your mileage up and your costs down. Check out the details. Every week fatal and/or near-fatal accidents involving sweepers are reported. Attenuator trucks, also known as 'safety cushion trucks,' have saved the lives of many sweeper operators. A constant but usually unnoticed fixture on freeways, the drivers of the shadow trucks serve as blockers for the street sweepers, the police cruiser often with them, and the trash-removing crews that sometimes walk ahead at the front. Without the street sweeping convoys, freeways everywhere would be a minefield of debris. And without the shadow vehicles, even the imposing sweepers themselves would be targets for inattentive or intoxicated drivers. Read the story. In 2014 the World Sweeper office received a number of reports from parking lot sweeping contractors concerning trouble they were having with the fuel systems on their Isuzu chassis. These seemed to center on the 2006 and 2007 model years. We offer an article and 26-minute audio interview with a top Isuzu fleet manager to discuss the realities of the situation. This article includes many tips for maximizing the chassis fuel system, as well as some additional information about ways to maximize transmission longevity. Read/Listen to the story. Today's diesel fuel industry is far different from what it was just a decade ago. Changes in diesel engine designs, driven by increased EPA regulations, have caused critical issues for OEMs as well as for those who operate diesel engines in their fleets. In this article, we will discuss several leading issues regarding today's diesel-fueled engines, as well as steps that sweeper owners and operators might want to consider for preventing premature diesel engine failure. Includes audio podcast with the Vice President of Texas Refinery Corporation. Read/Listen to the story. Starting in 2010, virtually all trucks sold in the U.S. had to meet new, much more stringent emissions' standards. The following is a layperson's explanation of the two technologies that currently are being used to meet the new standards. Read/Listen to the story. Interview with Bill Haaker, CEO of California-based, Haaker Equipment Company, Inc. Haaker is an expert on the transformation of heavy equipment chassis vehicles, such as those used on street sweepers and catchbasin cleaners, to use alternative fuels such as CNG and LPG. Read/Listen to the story. The Municibid.com website specializes in working with municipal entities. In fact, only municipalities may sell equipment on the site. And, instead of doing what so many other auction companies do, which is to charge a percentage of each sale, the Municibid.com concept is to offer its services to municipalities for a modest fee per year. Read/Listen to the story. Steve Kibler, a 20-year veteran of municipal fleet management and head of that department for Loveland, Colorado, offered his rules of thumb for managing municipal fleets at APWA 2008. In this audio interview with Kibler, he transmits the many ideas he has developed for making his fleet management department accountable and productive. Read/Listen to the story. Fuel prices have never risen so quickly. Here are a variety of tips for conserving fuel usage, which will help you keep a line on costs and, if you're a contractor, stay competitive with your bidding. Read all about it. Biodiesel has many advantages and will soon be available nationwide. Make sure you make the right decisions about implementing biodiesel as a fleet fuel. Includes audio interview in .mp3 format. Read/Listen to the story. Here are some of the factors that will help you create a state-of-the art public fleet operation and establish a business enterprise that uses best management practices to compete successfully with private sector entities. Includes 19 minute .mp3 audio interview with 25+ year fleet manager. Read/Listen to the story. This thought-provoking analysis of the cost and productivity of mechanics, as well as size of shops needed for in-house repair work, is provided by John Dolce, noted fleet management professional. Includes a handout list of 11 items for a shop manager to consider each day in order to maximize shop productivity and minimize disruption for vehicle users. Read the story. On average, one in 10 workers on construction sites is injured. With an industry workforce estimated at about 9.6 million workers, that means almost a million workers in the United States receive some type of injury each year. Because sweepers are a type of machine not universally found on construction sites, they pose a larger danger than other, more familiar, types of machinery such as dump trucks, loaders, backhoes, etc. Article contains ideas on how to equip your sweepers so as to reduce the likelihood of accidents on jobsites. Article is in WorldSweeper's 'Safety Section.' Read about it. When preparing your fleet for winter, one of the most commonly overlooked items is the fuel itself. Fuel needs to be winterized, especially for trucks that are used throughout the winter. Read the best practice reminders. In 2014 the World Sweeper office received a number of reports from parking lot sweeping contractors concerning trouble they were having with the DPF systems on their Isuzu chassis. 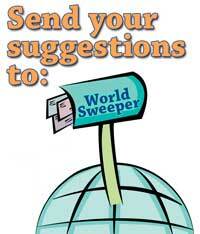 As a result, we distributed a query to members of the World Sweeping Association. This informal survey resulted in more contractors coming forward with their experiences on the topic. We also offer a follow-up story in this series, which is an article based upon a conversation with Mike Rossetti, Isuzu Commercial Truck's Director of Field Operations for the company. Read/Listen to the story. Brad Murphy, COO and Executive Vice-President, Subaru Industrial Power Products, wrote this article for the WorldSweeper reading audience. It provides a number of basic engine maintenance tips and a few troubleshooting tricks that will help in creating a sufficient preventative maintenance program.Check out the details. Considering a switch to biodiesel? Hear about the experience of two Pacific NW agencies when they implemented biodiesel as a fleet fuel. Includes .mp3 audio interview. Read/Listen to the story. In today's environmental climate, washing your sweepers and other vehicles without the proper procedures can result in more than just a large fine. Includes 20-minute .mp3 audio interview with one of the wastewater disposal industry's leaders. Read and Listen to the story. John Dolce discusses the way even single sweeper owners can benefit by the statistics available to larger fleets. If you don't know Dolce's '50/50 Rule, you may not be trading out your vehicles at the right time in their service life. Read the story. Discussion of features of MaintStar and Vehicle Tracker brands of fleet maintenance and management software. Read the story. The Fleet Management Liaison for NTEA provides five items to review and analyze in order to make sure your fleet maintenance program is on the right track. Read the story. Article discusses why and when card access fuel stations make good business sense. Read the story. Author discusses why synthetic oil may be of value. Read the story. Ultra low sulfur diesel will soon be the norm. Make sure your fleet is ready. Read the story. An expert with over 30 years of experience operating fleets of various types and sizes, John Dolce, tells how to determine when to keep machinery in your fleet and when to trade it in on something newer. Read the story.